An electrolyte and hydration mix that provides sustained energy while reducing fatigue without the use of sugar or caffeine. Question: Can I use less or more than the recommended amount of water when taking my BioSteel Sports Mix? Answer: You may alter your water levels in order to achieve your desired taste. 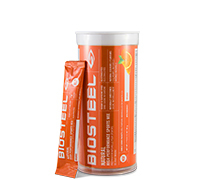 Question: Does the BioSteel Sports Mix have caffeine in it? Answer: BioSteel's Sports Mix does not contain caffeine or any banned stimulants of any kind. Question: Can I mix the BioSteel Sports Mix with my protein powder? Answer: Yes. This is perfectly safe and many customers have found this to work well. Question: Why does my BioSteel change colour when I'm outside? Answer: The BioSteel Sports Mix does change colour in the sun. The product is still perfectly safe and effective to drink when it changes colour, as this commonly occurs with outdoor athletes. This occurs because there are truly no artificial flavours or preservatives in the BioSteel Sports Mix. Our colour comes from natural red beet powder and much like a real beet, if left in the sun it will naturally change colour over time. With one drop of food colouring this would never happen, but then you would obviously not be drinking something that BioSteel stands for. Question: What does BioSteel's Sports Mix taste like? Answer: BioSteel's Sports Mix comes in four different flavours! Mixed Berry, Lemon-Lime, Orange and Blue Raspberry.